The Child and I completely opted out of Christmas, at least the endless socializing part of it. For years, we co-hosted Christmas and Thanksgiving with one friend, who has a son about The Child’s age; for years we have abandoned our Christmas treats and toys midday and headed off to play board games with people we see twice a year – three times, if they showed up at our cookie party – and only during the holidays. It seemed like a good thing, until The Child pointed out that she has exactly nothing in common with my friend’s son, who usually spends the time playing video games with his father, a man whose past I know too much about to make eye contact, most of the time. Other years, I would have felt too guilty to not attend Christmas at her house, but this year she did me a kindness: She declined Thanksgiving. And so, with no guilt, I decide to honor The Child’s request, and cancel our Christmas visit. She wants to eat cookies and go to the movies and maybe, if she gets lucky, play on the Xbox she hopes she’s getting. Instead of all the things we usually do this time of year, we do nothing except watch Christmas movies of varying degrees of quality, and bake cookies. Lots of cookies. I am not usually a maker of anything that involves melting chocolate, but when I ran across this unusual recipe from the Tartine No. 3 cookbook in several places (Tasting Table, Saveur magazine), I thought it must be a sign to try something completely new. Rye flour in a cookie definitely qualifies as new to me, but once you get past that, there isn’t really anything unusual in terms of technique. As an added benefit, the recipe didn’t require me to do any rolling out or complex assembly, things I’m not good at but probably should try to learn, one of these days. These cookies, not unlike the lebkuchen, are not the prettiest cookies I’ve ever made, but they make up for it by being intense and sophisticated. 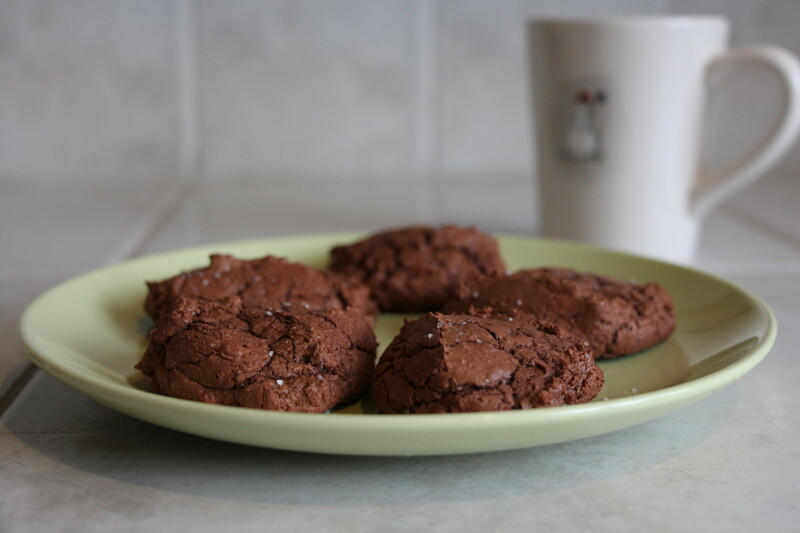 The bittersweet chocolate and rye flour together create a complex flavor, offset by just the right amount of sweetness. The cookies have the soft texture of a brownie, but none of the heaviness, and a slightly chewy texture. The dough was a little unnerving, because it’s all made with a whisk and when you’re done mixing, it looks more like a thick pancake batter than a dough, leaving me wondering if I’d done something wrong somewhere. After the required 30 minutes of refrigeration, though, the cookies were easy to scoop and drop. Don’t skip this part. Also, don’t skip the parchment paper, because the cookies are fairly delicate, but they came right off the paper with ease. Given the cookies’ intense flavor and lack of plate appeal, I expected The Child to turn her nose up at them, but she didn’t, and pronounced them delicious. The recipe doesn’t make a lot of cookies, but they are so rich and satisfying that they go a long way. Merry Christmas, one and all, and thank you for reading along this year. Whisk flour, baking powder and salt in a bowl; set aside. Place chocolate and butter in a heatproof bowl set over a saucepan of simmering water. Cook, stirring occasionally, until melted, 5 minutes. Remove bowl from pan; set aside. Place eggs in the bowl of a stand mixer fitted with a whisk attachment; whip until fluffy. With the motor running, slowly add sugar until eggs have nearly tripled in volume, about 6 minutes. Add reserved chocolate mixture and the vanilla; mix until combined. With the motor running, slowly add dry ingredients until a soft, loose dough forms. Cover dough with plastic wrap; chill 30 minutes. Heat oven to 350°. Using 2 tablespoons for each, drop cookies onto parchment paper-lined baking sheets, spaced about 2” apart. Sprinkle cookies with Maldon salt or fleur de sel; bake until cookies are puffed, about 10 minutes. Geez, these look delicious. I absolutely love the flavor of rye. I think I’ll try these today! They are so rich and delicious. I love rye, too!